An election contest board will meet on Friday and could decide who finally will occupy the 13th District seat in the Kentucky House of Representatives. Over the weekend, a recount resulted in a tie between Democrat Jim Glenn and Republican DJ Johnson, both of Owensboro. Johnson requested the recount after losing his reelection bid to Glenn by a single vote last fall. Over the weekend, the Daviess County Board of Elections recounted more than 12,000 ballots by hand. Glenn came out ahead by three votes, but after an appeal by Johnson's attorney C. Michael Shull III, the board voted to give one of those votes back, leaving Johnson down by two votes. The panel then decided to count five of 17 rejected absentee ballots. Three were in favor of Johnson, one went for Glenn, and one was blank, resulting in a tie. Glenn's attorney, Anna Whites, is claiming that Johnson's attorney interfered with the recount by requesting the Daviess County Board of Elections to review a ballot they previously determined as invalid. "The statute in the law provides that you can witness the vote count, but you are not a participant," Whites told WKU Public Radio. "This is not a proceeding in which you engage with those who are designated by law to count the votes." The voter casting the ballot in question had marked the box for a straight Republican ticket, but drew a line through the box, and voted in several individual races. The voter didn't vote in the 13th District race, but the voting machine counted the ballot as a straight ticket. The Daviess County Board of Elections determined on Saturday that the voter didn't intend to vote straight ticket, which took one vote away from Johnson. Shull, his attorney, then cited a voting regulation that says a horizontal line in a box counts as a vote. The board then decided to give the vote back to Johnson. "The good people on the Daviess County Board of Elections, who conducted the Recount on February 2nd, performed their duties with as much professionalism, transparency and integrity as anyone could ask for," Shull said in a statement to WKU Public Radio. "The (bipartisan) Board produced its own report of the recount last evening, and sent a copy to the Kentucky House of Representatives. There is no support in that report for the absurd allegations of “intimidation” made by Mr. Glenn’s attorney." According to Shull, he discussed the regulation with the county attorney, who then discussed it with the board. The Daviess County Clerk's Office sent its final report to the election contest board which will meet on Friday. State law, KRS 120.205(4), says the board must choose the winner by drawing lots, although Whites suspects it will come down to a coin toss. 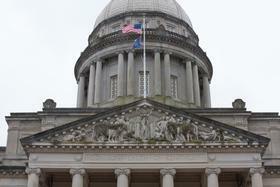 The GOP-led Kentucky House ultimately decides who will represent the 13th House District. Glenn has already been sworn into office, and Whites says she would sue if the House votes to impeach him. "There's no law that allows us to impeach or remove a sitting legislator by a coin toss, so we would protest any means of removing him," Whites said. The Owensboro-Daviess County region is home to several hotly-contested state House and Senate races that will be decided Tuesday. A special board overseeing an election challenge in the state House of Representatives has voted to conduct a recount of a contested seat in western Kentucky.